Photo by Hannah Richardson Henry Braxton gathered some of the children of Natchez. They will be among those receiving fireworks, fruit and hot dogs Dec. 23 when Braxton again dons his Santa hat to brighten their Christmas. From left are Jar’mya Lewis, 8, Saniyah Lewis, 14, Braxton, Kyree Lewis, 9, and Starr Lewis, 13. 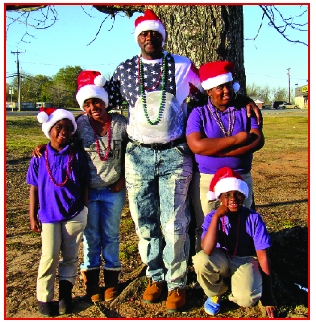 Christmas fruits, fireworks and hot dogs will be available to school age children of Natchez Dec. 23 courtesy of Henry D. Braxton. He has given the fruits and fireworks for 25 years and is adding the hot dogs this year. Friend Ricky LaCour joined the effort three years ago. “It makes me feel good,” Braxton said. “I like to see the smiles on the kids faces.” He said growing up he didn’t have much so giving back is a way of showing his love for his community and its children. He has funded the endeavor from his own pocket, but will accept donations to allow him to give more. “I want to personally give the stuff to the kids and shake their hands,” Braxton said. “I want to wish them all a Merry Christmas.” Braxton and LaCour will be set up beside Right Way Grocery on Hwy 71 in Natchez Saturday, Dec. 23 at 1 p.m. to distribute the gifts.